A Landry’s Gift Card truly offers something for everyone. It’s the all-purpose pass to legendary dining, exciting retail options, unmatched amusements, and award-winning hospitality venues. 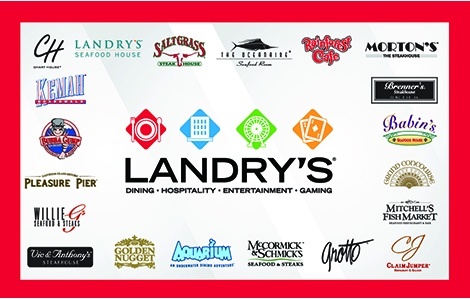 Unlike traditional restaurants, the Landry’s Gift Card may be used at more than 500 Landry’s locations in the U.S. providing the recipient flexibility of where to spend their gift. Some more popular Landry’s destinations include Morton’s-The Steakhouse, McCormick & Schmick’s, Claim Jumper, Chart House, Saltgrass Steak House and experiential dining destinations such as Rainforest Café. To find a location near you, visit our website at www.landrysinc.com.